The growth of college tuition may be the trend that grabs headlines, but its slope can’t match that of how much the top football-playing universities spend on athletes. According to the report, the growth in per-athlete athletic spending outpaced the growth in per-student academic spending over that time period in all subdivisions of Division I athletics. 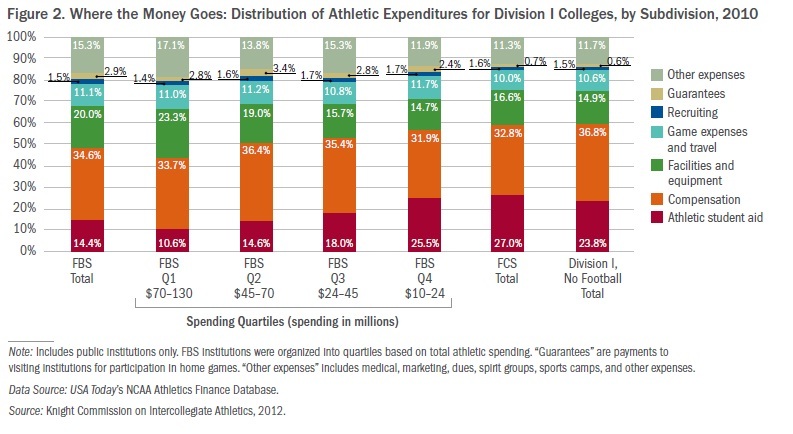 In general, the report found that Division I universities and colleges tended to spend roughly three to six times as much on athletics per athlete as on academics per student, with the ratio exceeding 12 times in the Southeastern Conference, home of the last seven NCAA national champions in football. Whether comparing per-student academic funding and per-athlete funding for athletics is valuable to the debate is an open question. Many in higher education argue that participation in Division I athletics generates benefits for the entire institution, including donations, applications, regional economic returns, school spirit and even state support. The report did not explore the financing of Division II or Division III programs. The report notes that, during the downturn, while many institutions faced financial pressure and cut academic programs, only a few Division I institutions – including the University of Maryland at College Park , the University of California at Berkeley , and Rutgers University – cut athletic teams or spending to cope with budget cuts. The University of Maryland has since moved to a different conference  in hopes of generating more revenue and restoring the cut programs. The report finds wide variation in how institutions fund their athletic programs, with the largest FBS programs employing a different financial model from other institutions. For institutions in the FBS subdivision, more than 80 percent of revenues came from “generated” sources such as ticket sales, conference payouts and donations. The report notes that newly negotiated television contracts – often the result of conference realignment – will bring in more revenues for the largest programs, increasing the disparities. At FCS and non-football institutions, trends were reversed, with more than 70 percent of athletics funding from institutional subsidies and student fees. On the expense side, FBS universities spent a larger share of their budget on facilities and equipment than non-FBS institutions. All subdivisions spent roughly the same percentage on coaches' salaries. 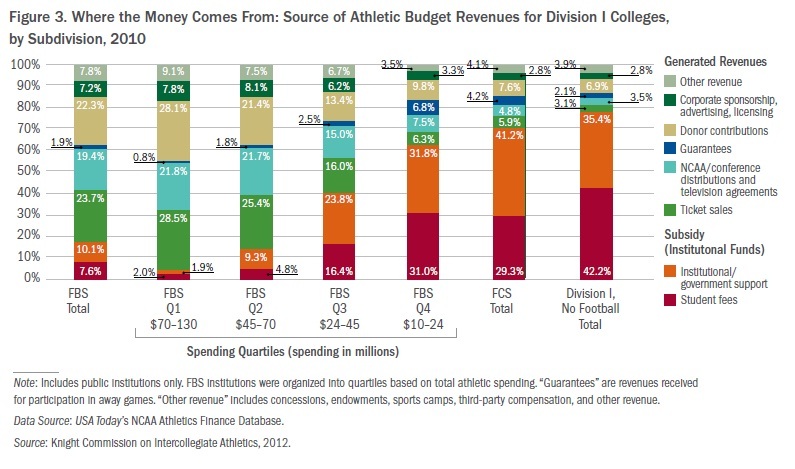 Within the FBS, however, the budgets for the smallest quartile of athletics departments more closely resembled those of the FCS and non-football schools, in terms of both revenues and expenses. 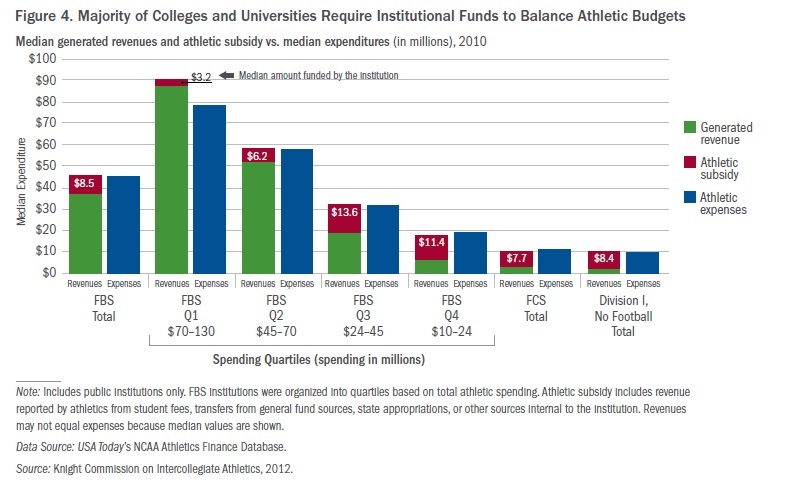 Institutions in the middle two quartiles of the FBS saw their spending increase the most over the time period and saw a greater share of their athletic department revenues come from institutional support rather than generated revenues. “While these midlevel institutions were aggressively trying to reach the top tier, the bottom quartile of institutions appeared more inclined to accept their less competitive position,” the report states. The report notes -- as have many others -- that most athletic departments are not self-supporting. Only one in four institutions in the FBS generated more money than it spent in any given year between 2005 and 2010, the report states, with almost none of the FCS or non-football programs generating a profit. Median subsidies for Division I institutions ranged from $7.7 million to $8.5 million, with the largest FBS institutions seeing the smallest subsidies and the smallest FBS institutions seeing the largest.